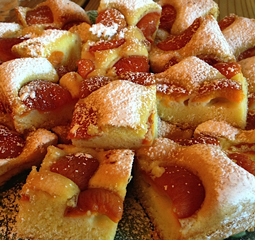 Austrian Apricot Cake - A recipe from Savor California, the online showcase for extraordinary gourmet foods and beverages from California. In Austria, this is cake called Aprikozen Fleck. Gluten-free flour may be used. Grease a 9” x 11” baking pan with grapeseed oil and dust with flour. Whisk eggs and sugar till creamy. Add grapeseed oil, flour, salt and baking powder. Continue to mix until all dry ingredients are mixed in. Pour into prepared pan. Top entire pan with half pieces of fruit. Bake for 45 minutes until golden. Dust with powdered sugar.